In June 1967, the one-eyed Moshe Dayan staged his entrance into occupied east Al Quds to mirror that of British General Edmund Allenby, who walked through the same gate after defeating the Ottomans fifty years earlier. The theatrics guaranteed that Dayan’s instrumental role in bringing some of the holiest sites in Islam, Christianity and Judaism under ‘Israeli’ occupation, would not be forgotten by the history books. In fact, the ‘Israeli’ minister’s considerable contribution also encompassed a role in coining the now-universally accepted name of that conflict – The Six Day War – which is a biblical reference to God’s creation of the world in six days. During a meeting in Budapest on July 11 that same year, Brezhnev and his colleagues outlined an array of “weak points”, starting with the absence of “political unity” among the Arabs. Fast-forward to the modern-day Middle East, and those weaknesses are more apparent than ever; morphing into unholy alliances, espousing religious persecution and legitimizing the ‘Israeli’ occupation of Arab lands. The current inferno engulfing Al Quds is little more than a natural progression of the path chartered by Moshe Dayan five decades ago; the collective punishment of the Palestinians and burgeoning ‘Israeli’ control over the city’s al-Aqsa Mosque – Islam’s third holiest site. The most recent discriminatory restrictions by the ‘Israelis’, which included barring men under 50 years of age from taking part in Friday prayers, left five Palestinians dead and hundreds injured. But despite the carnage, most Arab regimes remained conspicuously silent, failing to produce public displays of solidarity with the Palestinian cause, or translate Arab and Muslim anger into mass demonstrations – or even harshly critical articles. Arab monarchies in the Persian Gulf refrained from making any concrete public statements on the matter. 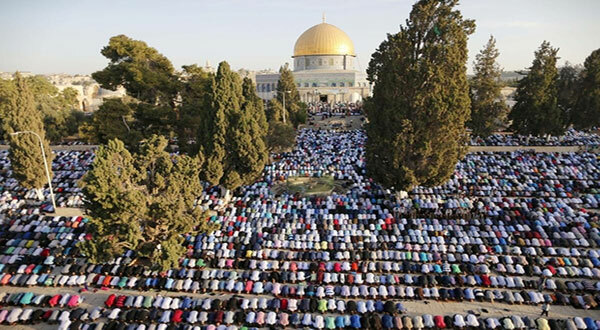 The silence extended to news reports, where one would have been hard pressed to find much in the way of details concerning events at the al-Aqsa compound. During a televised interview, Bahrain’s Foreign Minister, Khalid bin Ahmad Al Khalifa, broached the subject in a noticeably dismissive manner, stating that ‘Israelis’ and Palestinians dying is something “happening every day”. Such sentiment can hardly be described as surprising, at a time when Arab monarchies are proposing concrete steps toward establishing better relations with Tel Aviv. And as the standoff in Al Quds stretched into its second week, a similar ban, nearly 2,000 kilometers away in Bahrain’s northwestern village of Diraz, hit the 54-week mark. Diraz, which has been besieged by Bahrain’s security forces since last summer, houses the Imam Al-Sadiq Mosque, where Shiite worshipers have been barred from congregating for Friday prayers since last summer. The restrictions – part of the regime’s clampdown on the kingdom’s Shiite majority and political opposition – are increasingly mirroring tactics employed by the ‘Israeli’ occupation, including widespread arbitrary arrests and forced demographic changes. However, Manama and Tel Aviv appear to have a lot more in common than a shared interest in persecuting religious majorities. In May, Manama provided a forum for a verbal clash between the ‘Israeli’ and Palestinian soccer leaders, when it played host to an ‘Israeli’ delegation at the annual FIFA congress. The end result was touted as a “victory” by Tel Aviv. 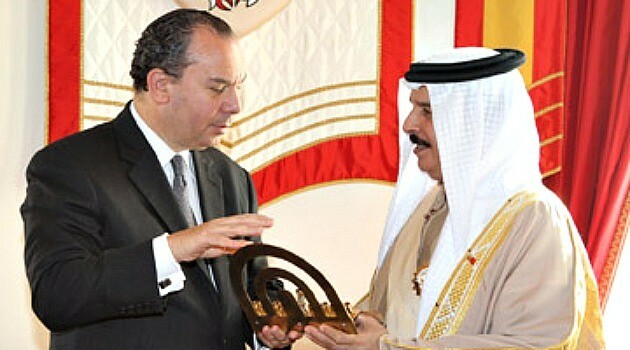 In January, an official in Tel Aviv told The Times of ‘Israel’ that his government enjoys “good relations” with the Bahraini monarchy, and in 2016 Manama’s top diplomat paid tribute to the late ‘Israeli’ President Shimon Peres, whose lengthy political career was marred by allegations of war crimes against the Arab people. The regime also came under a wave of criticism after hosting a Zionist delegation for a candle-lighting ceremony marking the first night of Hanukkah. It goes without saying that these relations are not based on shared values or deep intimacy but rather a common goal of undermining Iranian regional interests. In this respect, Bahrain is only a small extension of Saudi foreign policy, which now openly recognizes the need to sidestep the more intractable issue of Palestinian statehood for the sake of better ties with Tel Aviv. Is Riyadh betting on history repeating itself? 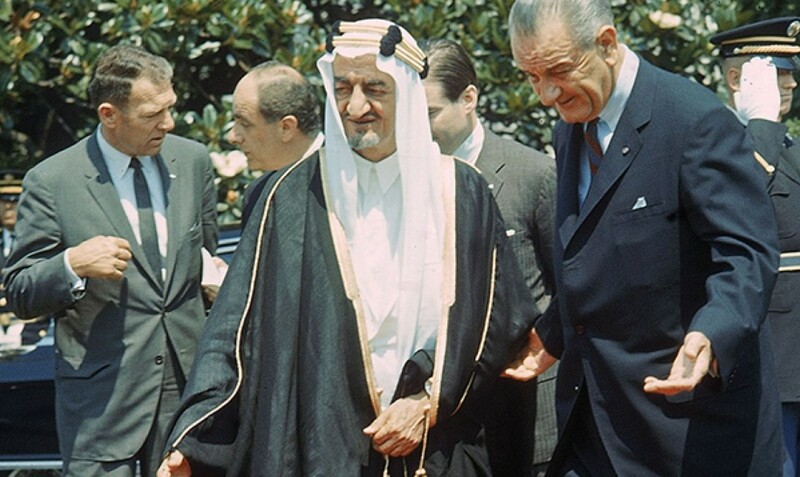 In the lead-up to the 1967 war, the title of ‘the greatest threat to the survival of the Saudi kingdom’ – currently reserved for the Islamic Revolution and Shiite Iran – was held by secular revolutionary Arab nationalism led by Egyptian President Gamal Abdel Nasser. At the time, the kingdom and Egypt were fighting a proxy war in Yemen with 50,000 Egyptian troops backing the Republican government in Sana’a. The kingdom was on the defensive and under severe strain. At home, the Royal Saudi Air Force was repeatedly grounded in the 1960s because its pilots kept defecting with their jets to Egypt. Rumors of coup plots were widespread. And then, miraculously, the ‘Israelis’ devastated the Egyptian army. The ’67 war also dealt a mortal blow to Nasser’s Arab nationalism, which would eventually be eclipsed by the rise of political Islam. Saudi Arabia’s King Faysal quickly sprung into action, cutting oil exports to the U.K. and the U.S. in what would turn out to be more of a symbolic PR stunt than an effective measure against the ‘Israeli’ allies. Nevertheless it was more than enough to transform Riyadh into the new champion of the Palestinian cause, especially when it came to Al Quds and its Islamic Holy sites. Surely the Saudis are not hoping for an identical outcome in their dispute with the Iranians. After all, the notion of ‘Israeli’ invincibility, established after the ’67 war, has long been shattered, and even the ‘Israeli’ identity conceived by Dayan-era officials is facing an existential crisis. But perhaps the thinking in Riyadh is: ‘the ‘Israelis’ saved us once, maybe they can do it again’. Russia through the force of its President Vladimir Putin and its Foreign Minister Sergei Lavrov was present in two important stations outside the priorities of the US President Donald Trump, and beyond its distinguished relationship with Turkey as well as its keenness to support it with a balanced role within a regional system led by Moscow where Ankara and Tehran represent its parties. Moscow had an understanding with Paris that allows its inclusion to the efforts of building a new regional system under the sponsorship of Russia, it made the same thing with Cairo. In the US absence of the war of Libya between the government of Firas Al-Sarraj who is supported by Turkey and NATO, and the commander Khalifa Hafter who is supported by Egypt and Saudi Arabia. Moscow devoted its importance to support Egypt, but in a remarkable change toward the political rationality the new French President Emanuel Macron after his meeting with the President Putin emerged to announce the support of a political solution in Syria that does not impose a negative attitude towards the Syrian President, on the contrary it paves the way for a cooperation with him on the basis of the Russian equation, which based on linking the transitional stage with keeping the state and its institutions, which means adopting the constitutional shift starting from a government in the light of the Syrian President and ending with elections according to a new constitution in which he participates. When the Egyptian Foreign Minister Sameh Choukri talks about a strategic cooperation in the war on terrorism that includes logistic, technical, operations, and intelligence support through a joint operations room with Russia, and when the President Macron talks after his meeting with the President Putin about a strategic cooperation committee that aims to put a comprehensive vision about the war on terrorism and the establishment of a comprehensive stability in the region, without ignoring to indicate to open the French embassy in Damascus but it is not among the priorities now, after it was from the taboos, then this means the success of Moscow to include two important forces in the policies of the Middle East; France and Egypt along with Turkey and Iran even from different positions to create the political solutions as the necessity of the war on terrorism. To the extent through which Macron knows that the French interior supports a foreign policy that based on the openness to Russia and the solution in Syria in cooperation with the Syrian state, after his ancestor Hollande has put his popularity a cost for a reverse consideration, the Egyptian President Abdul Fattah Al-Sisi and his government know the vitality of the battle of Libya for the security of Egypt, and they both know that NATO will not support Egypt in its war against the government of Al-Sarraj, while Russia will not break up its relation with Turkey which supports Al-Sarraj, but it will continue supporting Egypt to win this war. France and Egypt were observing carefully the last wars of the US administration before making the critical shift toward Russia. The war has a title to prevent the connection between the Syrian army and the Popular Crowd across the Syrian-Iraqi borders, because this connection means practically resolving the course of war and the direction of the new balances, but this connection is no longer possible to be prevented after the arrival of the Popular Crowd to the Syrian borders and the progress of the Syrian army by having control over twenty thousand square kilometers from Badia towards the borders despite the US warnings. Mohammed Bin Salman will go to Moscow to meet the President Putin having these considerations along with the need to cooperate with Moscow to control the oil market and its prices, after the Saudi expenses have been increased, and after the deficit resulted from the visit of the US President increased. – فيما حضرت روسيا بقوة برئيسها فلاديمير بوتين ووزير خارجيتها سيرغي لافروف في محطتين هامتين خارج دائرة أولوية الرئيس الأميركي دونالد ترامب، وعابرة فوق علاقتها المميزة مع تركيا وحرصها على استيعابها بدور وازن ضمن منظومة إقليمية تقودها موسكو وتمثل أنقرة وطهران جناحيها، توّجت موسكو مع باريس تفاهماً يتيح ضمّها لجهود بناء نظام إقليمي جديد برعاية روسية، وفعلت الشيء نفسه مع القاهرة. ففي غياب أميركي عن حرب ليبيا بين حكومة فايز السراج المدعوم من تركيا وحلف الأطلسي وقائد الجيش خليفة حفتر المدعوم من مصر والسعودية، وضعت موسكو ثقلها لمساندة مصر. وفي تغيير لافت نحو العقلانية السياسية خرج الرئيس الفرنسي الجديد إيمانويل ماكرون بعد لقائه الرئيس بوتين ليعلن دعم حلّ سياسي في سورية، لا يشترط السلبية تجاه الرئيس السوري بل يفتح مجالاً للتعاون معه إلى قاعدة المعادلة الروسية التي تقوم على ربط المرحلة الانتقالية بالحفاظ على الدولة ومؤسساتها، ما يعني اعتماد الانتقال الدستوري، بدءاً بحكومة في ظلّ الرئيس السوري وانتهاء بانتخابات وفقاً لدستور جديد يشارك فيها. – عندما يخرج وزير الخارجية المصري سامح شكري يتحدث عن تعاون استراتيجي في مجال الحرب على الإرهاب، يتضمّن دعماً لوجستياً وتقنياً وعملياتياً واستخبارياً عبر غرفة عمليات مشتركة مع روسيا، ويخرج الرئيس ماكرون من لقائه مع الرئيس بوتين يتحدّث عن لجنة تعاون استراتيجي بهدف وضع تصوّر شامل للحرب على الإرهاب وإقامة استقرار شامل في المنطقة، من دون أن يستبعد فتح السفارة الفرنسية في دمشق بقوله ليست ضمن الأولويات حالياً، بعدما كانت من المحرّمات سابقاً، فذلك يعني نجاح موسكو بضمّ قوتين وازنتين في سياسات الشرق الأوسط هما فرنسا ومصر إلى جانب تركيا وإيران، ولو من مواقع مختلفة وخلافية، لصناعة الحلول السياسية كخلفية ضرورية لخوض الحرب على الإرهاب. – بالمقدار الذي يعرف ماكرون أنّ الداخل الفرنسي يساند سياسة خارجية تقوم على الانفتاح على روسيا والحلّ في سورية بالتعاون مع الدولة السورية، وأنّ سلفه هولاند وضع رصيده الشعبي ثمناً لعناد معاكس، يعرف الرئيس المصري عبد الفتاح السيسي وحكومته حيوية معركة ليبيا لأمن مصر، ويعرفان أنّ الأطلسي لن يساند مصر في حربها على حكومة السراج، بينما لا تتوقف روسيا عند علاقتها بتركيا الداعمة للسراج وتمدّ يدها كما في السابق لمصر للفوز بهذه الحرب، لكن فرنسا ومصر كانتا تراقبان بعناية آخر حروب الإدارة الأميركية قبل إحداث النقلة الحاسمة نحو روسيا. والحرب لها عنوان هو منع التواصل بين الجيش السوري والحشد الشعبي عبر الحدود السورية العراقية. وهذا التواصل يعني عملياً حسم وجهة الحرب ووجهة التوازنات الجديدة، وهو تواصل ما عاد ممكناً منعه بعد بلوغ الحشد الشعبي الحدود مع سورية، وتقدّم الجيش السوري بالسيطرة على عشرين ألف كلم مربع من البادية باتجاه الحدود، رغم الإنذارات الأميركية. – يتوجّه محمد بن سلمان إلى موسكو للقاء الرئيس بوتين، وأمامه هذه الصورة ومعها الحاجة لتعاون موسكو في ضبط سوق النفط وأسعاره، بعدما زادت النفقات السعودية وزاد العجز بمترتبات زيارة الرئيس الأميركي. Palm Sunday Attacks Against Christians–What are the Ramifications? At least 44 people have been killed and scores of others injured in bombings carried out at two Coptic Christian churches in Egypt. ISIS has claimed responsibility for both attacks, while the US government, which essentially has served as ISIS’s air force in Syria, has somewhat hypocritically condemned them. 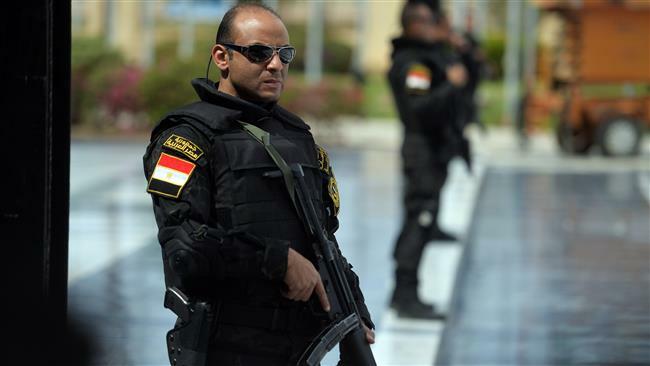 The first attack occurred in Tanta, a city located in the Nile Delta between Cairo and Alexandria. The bomb went off at the St. George Church, where worshipers had gathered for Palm Sunday services. At least 27 people were killed and 78 wounded. A few hours later, a second bomb exploded–at the St. Mark’s Cathedral in Alexandria. Here at least 17 were killed and some 48 wounded. 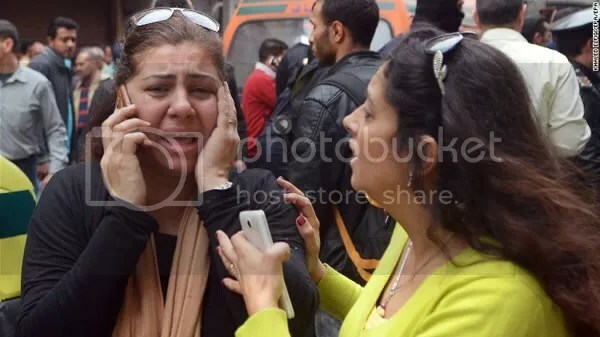 “So sad to hear of the terrorist attack in Egypt. U.S. strongly condemns. I have great…confidence that President Al Sisi will handle situation properly,” said President Trump. But US efforts to overthrow the President Bashar Assad in Syria would suggest that the US government has little concern about protecting Christians in the Middle East. The church bombings come just three days after the US launched Tomahawk missiles at a Syrian airbase in Homs province in western Syria, and this wasn’t even the first attack carried out by US forces against those defending their homeland from terrorist invasion. On September 17 last year, US coalition aircraft struck a Syrian airbase in Deir ez-Zor province in the eastern part of the country, killing at least 62 Syrian troops. The Obama administration claimed the attack had been an “accident,” but Assad said it was intentional and had lasted for an hour. “If previously we had suspicions that Al-Nusra Front is protected this way, now, after today’s airstrikes on the Syrian army we come to a really terrifying conclusion for the entire world: The White House is defending IS,” Zakharova said. And that was back in September. So let’s see…that’s two US attacks on two Syrian airbases in less than seven months. And in both cases Islamic State militants, almost as if they had been tipped off in advance, launched offensives immediately afterwards. All this to overthrow a man who heads up a secular government that has protected Christians. “After the explosion, everything became dark from the smoke,” said one witness of the attack in Tanta. “Deacons were the first to run out of the church. Many of them had blood on their white robes,” said another. One analyst, in comments to RT, expressed suspicion at the timing of the attacks. One who seems to be under no illusion on that score is Archbishop Atallah Hanna, of the Greek Orthodox church of Jerusalem. “These misguided American policies in the Middle East are a major reason behind the mass exodus of Christians from the region that has occurred over the years,” said Hanna. “Who created the terrorist groups and who is providing them with money and arms? Who has been destroying Syria, Iraq, Yemen, and Libya? Who caused the displacement of the Palestinian people? All catastrophes that Palestinians have suffered and are still suffering from were abetted by American and Western governments,” he added. Unlike the Christians of Egypt, those in Syria seem to have had a peaceful Palm Sunday. This is possible thanks to the Syrian gov’t, which the US wants to overthrow. If the Assad government falls, it will, needless to say, be a disaster for Christians in Syria. But there are indications this is precisely the objective the US now intends to pursue. The Washington Post on Sunday posted a pro-war propaganda piece informing readers the Trump administration has “demanded” that Russia drop its support for Assad. Not requested politely. But demanded. The story quotes a top national security advisor, Army Lt. Gen. H.R. McMaster, who strongly implies that Russia had advanced knowledge of the alleged chemical attack, while Secretary of State Rex Tillerson and UN Ambassador Nikki Haley are also quoted. “I think what we should do is ask Russia, how could it be, if you have advisers at that airfield, that you didn’t know that the Syrian air force was preparing and executing a mass murder attack with chemical weapons,” McMaster said. 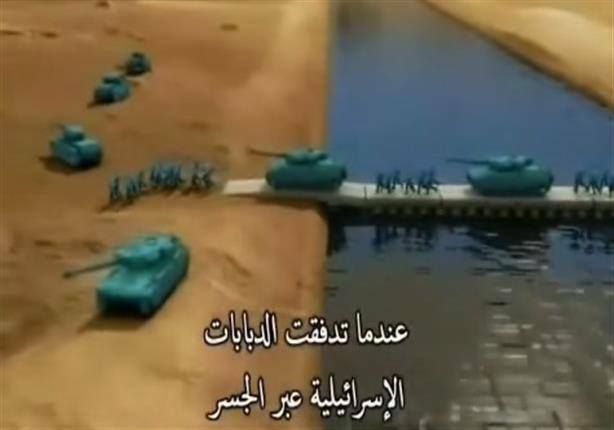 Meanwhile, South Front is reporting that the US is now deploying forces at the Syrian-Jordanian border, and that a Navy ship loaded with US military vehicles has also docked at the Jordanian port of Al-Aqapa. 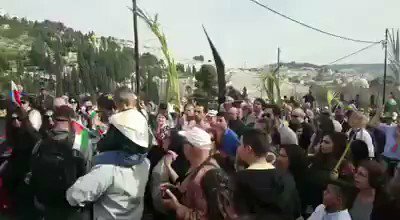 While there haven’t been any church bombings, Palm Sunday in Occupied Palestine doesn’t seem to have been entirely uneventful. 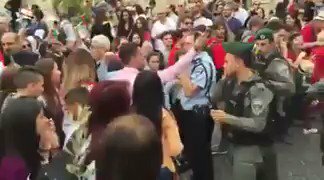 Israeli forces assault Palestinian worshippers for raising our flag during #PalmSunday procession today in occupied East Jerusalem. Filed under: AngloZionist Empire, Arab Christians, Arab Minorities, Assad, Brotherhood, Egypt, Egypt's Army, ISIL, Jurisprudence savagery, Nusra Front, Palestine, USA, Wahabism At Work, War on Syria, Zionist entity | Tagged: Copts, Richard Edmondson |	Comments Off on Palm Sunday Attacks Against Christians–What are the Ramifications?